You have 1 additional click to spend each turn. Clicks are everything, especially to a faction that has a winning amount of 3/2 agendas in their decks. Having that extra 4th click sets up the temporary remote to score those agendas freely from HQ, (save for Clot's interference). Biotic Labor is expensive and is a one-time use, Director Haas needs serious protection to avoid giving the Runner points, and Haas Arcology AI is too awkward to set up and protect, so what alternatives do we have? This Agenda, and a lot of risk taking. Mandatory Upgrades is a difficult Agenda to score. Although a Mushin No Shin can prep the card for a next-turn score, you'd better hope the single piece of ICE in front of it is good enough protection, or you're a demon with bluffs. Turntable is also salt in the wound if you do manage to score the Upgrades. Losing a potential 4th click and giving the Runner 2 points for the privilege hurts...but maybe that's a good thing. Data and Destiny brought about the next sleuth of cards to get us thinking of existing card combos, and one important combo is that of Mandatory Upgrades and Media Blitz. Now, with Media Blitz out, the Runner can steal your Mandatory Upgrades and you gain the benefit of the agenda as if you had scored it. With Lily Lockwell's Operation tutor ability, and HB's natural wizardry at fetching cards from Archives, there's a good chance you can recover Media Blitz and get it back online, even the turn after it was removed. An agenda that is extremely hard to score, but doing so is very strong. Not because of the point value - an agenda that will take, at minimum (and fast advance tricks aside), three turns to score is hard to pull off. 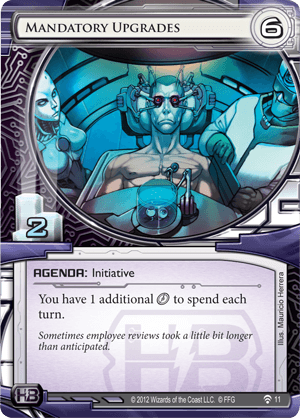 Yet doing so puts a clock on the runner, for as soon as a single Upgrades is scored any three for two in the corp deck will be scored out of hand with ease, for simply three credits on the table. While finding a scoring window through two of the runner’s turns (and consequently, 8 clicks to attempt to get in and score it) is difficult, many decks are finding the ability to do just that. It is best to see it early, to get it on the table before the runner is setup and ready to roll across servers. That proposition can be tricky at best, relying hard on a variance to see the card early. Decks are doing it however, decks that are getting wins at high level tournaments. It is not the largest impact, and it is still considered a fringe strategy - perhaps a reason why it is working so well. As stronger ICE is released, better early game ICE and ICE that is trickier to navigate, this could be a card primed to be pushed more into the spotlight.